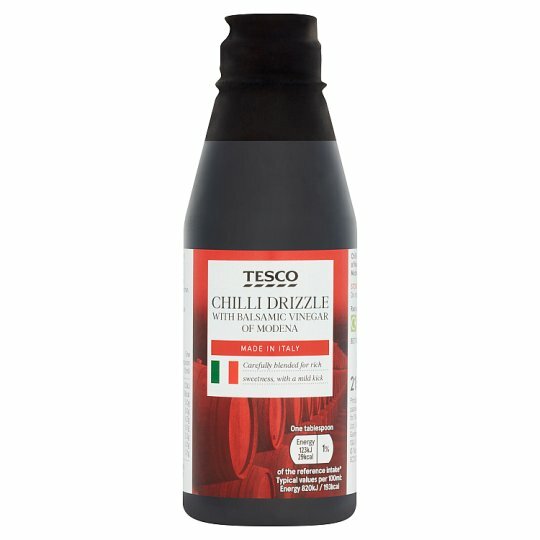 Chilli Drizzle with Balsamic Vinegar of Modena 'Aceto Balsamico di Modena PGI'. MADE IN ITALY Made with Balsamic Vinegar of Modena for rich sweetness, with a mild kick. INGREDIENTS: Aceto Balsamico Di Modena PGI (61%) (Wine Vinegar (Sulphite), Cooked Grape Must,(Sulphite)), Cooked Grape Must (Sulphite), Sugar, Stabiliser (Xanthan Gum), Flavouring, Chilli Powder. Store in a cool, dry place., Do not refrigerate.